Sulu Governor Sakur Tan addresses the participants to the recently concluded four-day livelihood training seminar in the southern province. 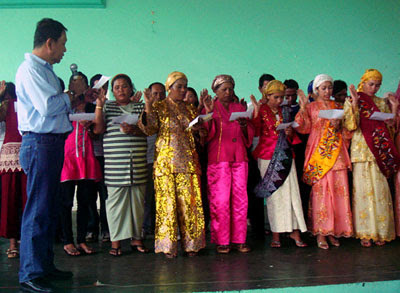 SULU, Philippines (Mindanao Examiner / May 19, 2011) – Some 300 people have finished a four-day livelihood training and seminar on fish processing technology in the southern Filipino province of Sulu, Governor Sakur Tan said. He said the seminar was conducted by the Department of Agriculture and the Bureau of Fisheries in partnership with the provincial government. “This livelihood training seminar is aimed at giving our people the necessary tool to start their own business and eventually provide jobs to others,” he said. 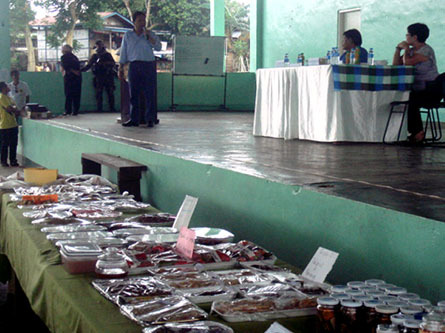 Those who finished the seminar came from different sectors in Sulu’s 19 municipalities and were taught how to prepare smoke fish, tempura, sausage, sardines and other food processing technologies, Tan said. He said the seminar and training were conducted by Gloria Nilo, chief training coordinator of the BFAR’s Regional Fisheries Training Center based in Zamboanga City, and Muhaimin Adjid, of the Sulu provincial agriculture office. Tan also encouraged the participants to organize themselves into cooperatives, and that he would work to ensure capitalization to start their business. He said more skills and livelihood trainings are now being planned by the provincial government to provide others the same opportunity and knowledge they need to start a business and be self-sufficient.